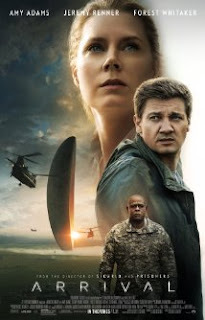 Arrival was a movie I was hyped on seeing because of Amy Adams and Jeremy Renner and of course because it is sci-fi and those flicks interest me. Both are great actors and both have superhero backgrounds in flicks we all know and love. In Arrival, Earth gets a visit from aliens and the whole world is confused on how to interact with or understand why they are here. Hence two great minds in science and communications (Renner and Adams) are called to help the U.S. government. Together, they interact with the visiting creatures and try to understand their language. Not only are they trying to communicate, there are eleven other space crafts around the world and other countries and their respective scientists are doing the same thing. Amy Adams' character is the first one to make a breakthrough by using drawings and words and the creatures respond with their own language and it is Amy's and Jeremy's job to figure out why they are here before the world beings to attack the aliens. Forest Whitaker's character is the colonel in charge at the landing site. He has understanding and patience despite the urgent situation the scientists are faced with. Rather than destroy the object and move on, he gives the two time to figure it out, and keeps the big wigs off their backs. I gave Arrival a yellow light because, although it is a sci-fi film, there's not much action but a lot of dialogue. It isn't bad by all means, but it is more of an adult movie, so kids or teens planning on watching this might leave really confused or if you are really into traditional sci-fi, you will fall in love with how different it was. I personally left confused but maybe I am over thinking it. If you check it out, really pay attention to every detail.